With a million - or two or three - in the bank it seems footballers these days are in search of an occupation a little more left field when the final whistle blows on their careers. 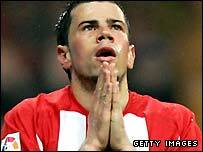 But a few eyebrows were raised when Mateja Kezman announced recently he wanted to become a monk. The former Chelsea striker has declared he intends to swap his boots for the robe when his playing days end, saying he spends "as much time as he can thinking of God". Admittedly, a few footballers have undoubtedly been saying their prayers recently for various misdemeanours but what happened to the age-old tradition of buying a pub in a quiet, picturesque village? Former Leeds and Scotland midfielder Peter Lorimer, 61, told BBC Sport he is not surprised that today's players are thinking outside of the box when it comes to their next career move. "Life has changed," said Lorimer - now the landlord of the Commercial Inn public house in Leeds. "Today's Premier League footballers won't have to look for other employment. They are well paid and will have big pensions but that wasn't the case with us. We had to earn a living after football. "I bought my pub because it is near Elland Road and it gives me the chance to still keep in touch with the fans and keep in contact with football." Kaka, the World Footballer of the Year, certainly will not be serving cocktails in Sao Paulo. AC Milan's Brazilian midfielder says he wants to become a preacher once he has finished converting us to the mesmerising wonders of one-touch football. Fellow South American Carlos Roa decided not to wait until his playing days were over before making a life-changing decision. A devout Seventh-day Adventist, the former Argentina goalkeeper temporarily quit the game at 29 to prepare for the apocalypse. Roa, better known to England fans for saving the fifth and final penalty from David Batty to knock Glenn Hoddle's team out of the 1998 World Cup in France, believed the world would end at the coming of the new Millennium and retreated to a farm in rural Argentina to preach while waiting for the four horsemen to arrive. "The year 2000 is going to be difficult," Roa declared. "In the world, there is war, hunger, plague, much poverty, floods. I can assure you that those people who don't have a spiritual connection with God and the type of life that he wants will be in trouble." Thankfully, Roa wasn't as talented at soothsaying as he was at saving spot-kicks and soon returned to football with his former club Mallorca. Not content with money, fame and world-wide adulation some footballers want to rule the world. 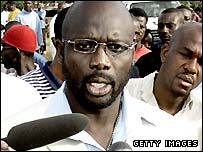 George Weah, a former World Footballer of the Year, has returned to the classroom in a bid to become Liberia's next president. The ex-AC Milan and Chelsea striker narrowly lost the 2005 race to become leader after being criticised for not being well-educated enough to run the West African country. In attempt to boost his chances of winning the 2012 presidential elections, Weah, who dropped out of school in his final year, has recently finished high school and is currently studying at a United States college in Florida. "Education is a continual process. It's like a bicycle, if you don't pedal you don't go forward," Weah told the BBC. "For now, I'm doing business administration and criminal justice, starting from there and then political science in the future." Weah isn't the first to put his head back in the books. Socrates, Brazil's bearded 1980s midfielder, has a doctorate in medicine and began working on a masters thesis that proposed football be reduced to nine-a-side in a bid to increase skill levels. The inimitable Socrates is no stranger to the debating chamber, either. Can you recall any baffling retirement plans by sports people? The chain-smoking former Brazil captain, a member of the Workers' Party and founder member of the movement Corinthians Democracy, became a leading figure in the push for political reforms in his home nation and is widely regarded as one of the most influential civilians to challenge, and ultimately end, the country's dictatorship. Readjusting to life after football is not always easy, however. Injury forced the former Arsenal and Newcastle United striker Malcolm Macdonald to retire before he was 30 and he initially struggled with the adaptation, turning to alcohol when the pain in his knee became unbearable. 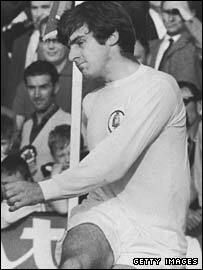 Once asked if he missed playing, Macdonald said it was "like asking an OAP if he wants to be young again". To lessen the shock of retirement some players have started to prepare for the inevitable. 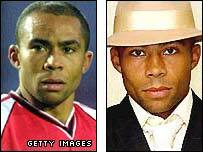 Former Manchester City midfielder Jim Whitley is treading the boards as an all-singing, all-dancing stage star. A serious knee injury sustained two years ago has halted his footballing career and, although he has not given up hope of playing again, the 32-year-old can currently be seen as Sammy Davis Jr in the tribute act The Rat Pack's Back. "It's all a bit bizarre," Whitley admitted to BBC Sport. "My brother-in-law, Dave Simpson, has a play out called Naked Truth and the producer of that show needed someone to play Nat King Cole for a show called Christmas Crooners. I went for an audition and got the part." Whitley toured Britain and Ireland with Christmas Crooners before being asked to take on the role of Sammy Davis Jr.
"I'm singing and dancing with singers who have sung in the West End and sometimes I wonder what the hell am I doing but I enjoy it," he said. "I've not been doing it for that long, so at the moment it's still like a hobby and I'm still taking each day as it comes." So, what next for the likes of David Beckham and Wayne Rooney? Maybe Becks will announce he is to follow in his mum and sister's footsteps and spend his retirement working at a hair salon (perhaps called Short Becks and Sides) in east London, while Rooney and his fiancée Coleen McLoughlin could become the new Richard and Judy. OK. Perhaps not. But as Becks himself says, nothing is impossible and there is little that could surprise us when it comes to the barmy world in which footballers inhabit.